Already one of the best Horse Racing Venues in the world Hong Kong is about to make racing even better for patrons and viewers. Hong Kong racing fans can look forward to a range of new initiatives from the Hong Kong Jockey Club that will enhance the customer experience in the new season, which starts on Sunday, 3 September at Sha Tin Racecourse. HKJC has long been a pioneer in the racing industry when it comes to embracing the latest mobile technologies and applying them to enhance customer convenience. By December 2017, HKJC betting account holders will have access to 10 self-service functions via a new online HKJC Customer Centre, available across a variety of platforms. Examples of self-services include managing personal account information, posting account enquiries, racecourse booking as well as priority service registration. More self-service functions which are currently manual-based will be added in the future to increase customer convenience. In addition, to better accommodate our customers’ mobile lifestyle, the HKJC TV app, with over 800,000 downloads, will be enhanced with more live statistics to racing fans. Thirdly, QR Code betting will be added to existing betting apps, enabling customers to scan the code and instantly add a betline. QR Code betting will be available for football, racing (e.g. Triple Trio Quick Pick, Jockey Challenge) and Mark Six bets. This is a first step for the Club to move along the trend of O2O services. In addition, the Club’s public racecourse booking system has registered Alipay HK as another payment means. The launch will be associated with food and beverage coupon discounts on public enclosure venues along with surprise offers throughout the season. The key underlining goal of the changes is to provide better quality and more choices to customers. Based on customers’ feedback, the Club’s official Chinese racing broadcasts on J2, in off-course betting branches and on-course are being refreshed with new presenter line-ups in the new season, while the Club’s cooperation with NOW TV will be strengthened. A new channel, NOW Sports Prime (Channel 630), will carry the Club’s official racing programme while a new proprietary programme will be added to NOW 668. In addition, catering to increasing customer viewing preferences of shorter live clips on social media, the broadcasting team has also made plans to encourage and support more racing journalists in the production of their own Facebook Live racing clips. “To be customer-centric, the Club should embrace an open mind to the way customers want to consume racing information,” remarked Mr. Cheung. Commingling has become a key growth driver for turnover, totaling HK$6.5 billion last season which represents an 87% increase from the previous year. The high quality and integrity of the racing sport and the size of the betting pool in Hong Kong continue to attract overseas customers. To better serve our overseas racing fans next season, the Club has been working with media partners across the world. 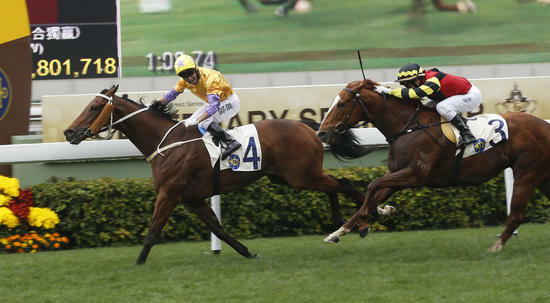 Racing Post and UK-based broadcaster At The Races will provide expert analysis and tips on Hong Kong throughout the season, while Racing UK will introduce a weekly live racing program focused on Hong Kong. Irish racing fans will enjoy access to Hong Kong racing information via The Irish Field and IrishRacing.com, while Australian customers can engage through a new connection with Punters.com.au. The venue renovations across Sha Tin and Happy Valley racecourses continue to be well received by customers. In the new season, new venues will include Farrier On 1 public betting hall and Co-Tack public restaurant at Happy Valley. At Sha Tin, the Grandstand 1/F Paper Badge Betting Hall has also been renovated. The vibrant racecourse atmosphere in Hong Kong has always been a key attraction for racing fans. This will be sustained with our major racedays in Sha Tin as well as a full year of Happy Wednesday Themed Events. The “Go Racing Ladies” campaign piloted last season has been a success. It will be bolstered this season to further enhance racing’s attractiveness to female fans. Catering to more mature racing fan segments, the Club will add a series of age-friendly services to create an even more enjoyable racing experience. Special themed events will be organized at cross-betting locations for senior fans. Racing fans hoping to land a big score will enjoy some mega prizes on offer over the first 2 weeks of the season. Jackpots totaling HK$60 million of prizes across various exotic bet types will enrich the pools in the hope of getting the season off to a prosperous start.